It’s nice to be part this global network of people who are linked only by their fleeting time together during what feels like a whole life lived in experience ‘pon da road’. A tribe of wandering spirits who cross paths with each other briefly, before promising to visit each other’s respective countries, or to plan a trip together in the future. All sincerely meant but rarely achieved. On more than one occasion I met stupendous people who went on to connect with other tremendous people that I’d met previously. Social media is a great way to witness this take place. The world is truly shrinking. A scorched temple in the old capital of Ayutthaya, burned during a war with the Burmese. I met so many people who had quit their jobs and were flinging themselves out into the great blue yonder. This is was an everyday occurrence and a great source of comradery. So being around these vagabond traveling types for so long it takes a little bit of brain power to gain some perspective on what it is I’m doing. Is this not normal? There’s also a lot that has happened to me in the past year and I’ve drafted and redrafted this post to start as I mean to go on…succinct and to the point. Although I feel that’s like trying to ask a fish to climb a tree. Anyway. I digress. Of course. I left England on July 5th 2016. I wanted to leave on independence day, it would have had a nice poetry to it but anyway, it was my independence day. It was Stupid O’Clock on a typical English morning in July – nail bitingly cold. I said my last goodbyes and catch a coach to London, Victoria Station. It was quite an incredible feeling, if you like feeling sick and aggressively nervous. The modern day equivalent of a spotted handkerchief tied to a stick. I get to the airport and there’s some vague issue with the fact that I only have a one-way flight to Bangkok and no forward travel plans. I tried to explain that I didn’t know where I was going but I did have a visa for Australia that needed to be used before June 2017, 11 months away. So, there was that. This seemed to appease them and I was let on the plane. I remember crying, hard, when boarding and for about 30 minutes during the first flight from London to Dubai. I couldn’t talk to anyone I knew and I was totally alone. Utterly. Alone. After a two bloody long flights, including a stop off in Dubai airport that felt more like a smoke-room dream, I landed in Bangkok. From the top of a sky bar in Bangkok. As poor and lowly travelers this was an extremely scandalous thing to do but we put on our best elephant pants and enjoyed the view. It was hot as hell and I had no idea what to do. I’d read books, blogs, forums but when presented with the reality of navigating myself around a world labelled with writing that appears to be made of flowers, I found myself at a loss. So I jumped in a taxi and said, ‘Khao San Road’. The only concrete thing I had for the rest of my life was a 3 night booking in a hostel in that area. Hoping that he was actually taking me there I blearily took my place on the back seat, clutching my money and passport, ready to bail at the first sign of trouble. Khao San Road. Chaos from dawn til dusk. Writing this now is bringing back to me the overwhelming sensual experience that is Bangkok. Honestly, it’s profound. The smell is the first thing that hits you, directly followed by the pulsating heat and then the ocular chaos of frenzied activity in every corner of your vision. It’s magnificent and I miss it. I stayed in the crummiest little hostel called the Sawasdee Bunglumpoo Inn, but in my naivety I thought that this is what I was to expect. My overarching memory of it was that it was blue. Blue walls, blue tables, blue bed. Blue. Everything was grimy and the free breakfast left a lot to be desired. The eggs made me feel bad for the chicken. The Sawasdee Bunglumpoo Inn. There were about 5 things withing a one mile radius called Bunglumpoo and another 5 called Sawasdee which meant finding the damn place was just a treat. To access it you had to walk down a dark sticky alley plastered in malnourished kittens and gilded spirit houses, dusted by decades of burnt incense. A very kind Thai man showed me where the hostel was. Graciously, he told me to wait with my bag while he found the correct alleyway. He left me with a smile and a feeling of hope that I wasn’t in fact, on an alien planet. How much could be said about this week in Bangkok? I could go into great detail about all the people I met at the hostels and how profound it was especially in those first few days. I had finally found my tribe. These gems of information become your IV drip whilst you’re traveling. It means you don’t have to worry about missing out or getting ripped off or staying in a bad hostel because the knowledge is out there. By way of this information swapping there’s such a sense of family, community and caring that becomes a soothing balm for homesickness. One of the first things to learn is that you should never pay what they ask for first time. Haggling is a huge thing there. There’s an art to it. Firstly, you walk up to a store, find something you’re interested in, ask for the price, smile and nod, walk away nonchalantly. They’ll call after you with a massive reduction, take a ‘baht’ off that (sorry, currency joke) and then you’re a true local. Gemstones in China Town. There’s a booming jewellery market in Bangkok, all of these are genuine. I remember learning some key lessons about Thai life from two amazing people. Sue and John, British ex-pats, retirees, who had spent most of their life working in Bangkok in the silver industry. 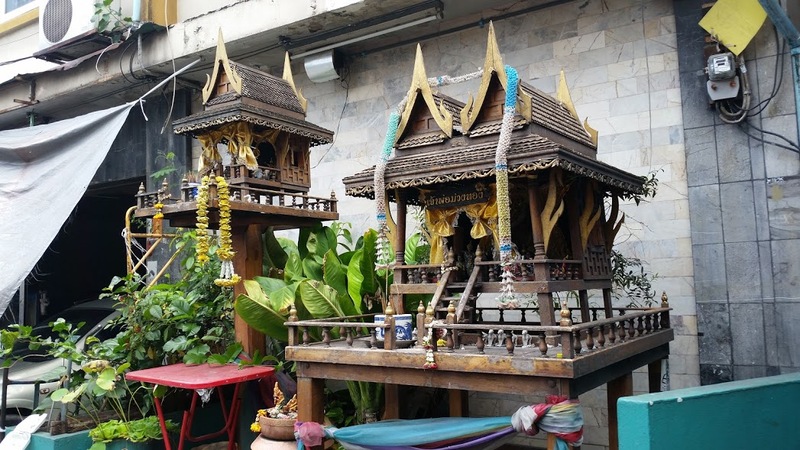 They now live in glorious apartments on the Chao Phraya river in Bangkok, shared by members of the royal family. I was granted the opportunity to visit them, taken for Dim Sum and then to China Town by the firey Sue. She would strike for bargins on muted fabric that she’d have made into tailored dresses and two-piece outfits. Our other shopping target was a suitable wig for one of her friends. They had spent two years in the early 90’s cycling around the globe. Literally. They encouraged me to see the beauty of Bangkok, their home. Truly incredible people. Luxury living. It was fantastic to have the chance to see another side of Bangkok. My first week was like being reborn. I had to learn how to get around, how to use money, what to eat and what not to eat. I spent a lot of time just wandering around, flabbergasted by how different life can be, realising how much of the world there is in the world and surrendering to how little I know of it. But, where are the sketches? I will sum up this first post by explaining the title. I would like to invite you on a visual journey through Thailand and Vietnam. This will be focused around my sketches supplemented with photographs. I didn’t open my sketch book and paint palette until Koh Lanta, my next stop on the journey, hence no sketches in this post. Other creatives will understand that sometimes you have to wander through the desert of denial, self doubt and lackluster inspiration before entering into full production mode. I had done my time. Years. I was finally ready. Panorama of Bangkok from the Golden Mount. If you’re ever wondering whether to just leave it all and head off into the world, I know how you feel. I agonised over it for years. Yes, it’s scary, but the one thing I learned from all of this is that cliches are always right, and nothing worth having isn’t scary or worth fighting for. So do it. By God. Do it. Fantastic. I’m so impressed by you and what you’ve achieved. More bottle than I had. Looking forward to reading about your new adventures. Love you.